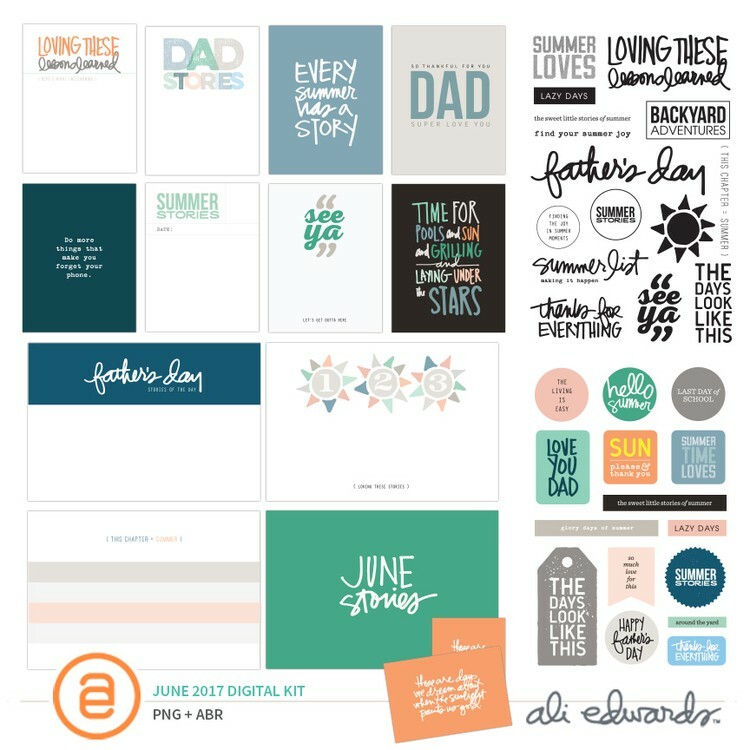 Welcome to Day Two of a one-week series on the basics of scrapbooking with your computer. If you are just joining in today you can check out the previous posts here. Below you will find a link for a small free element for you to download, unzip, and use. I will be incorporating it into the topics that will be addressed later this week - it's meant to give you a chance to actually practice going through the steps. If this is your first time downloading an element you may want to read the information below before clicking on the link. Today we are diving in and addressing the topics of downloading, unzipping, and organizing digital elements. As with many things in life, there are a variety of different ways all of these things can be done - many different approaches that end up at the same final destination. 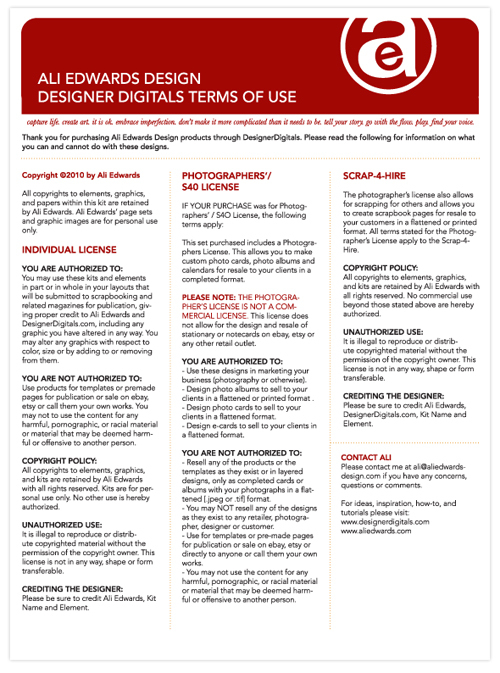 Let's take a look at my process for getting these digital elements into my computer. 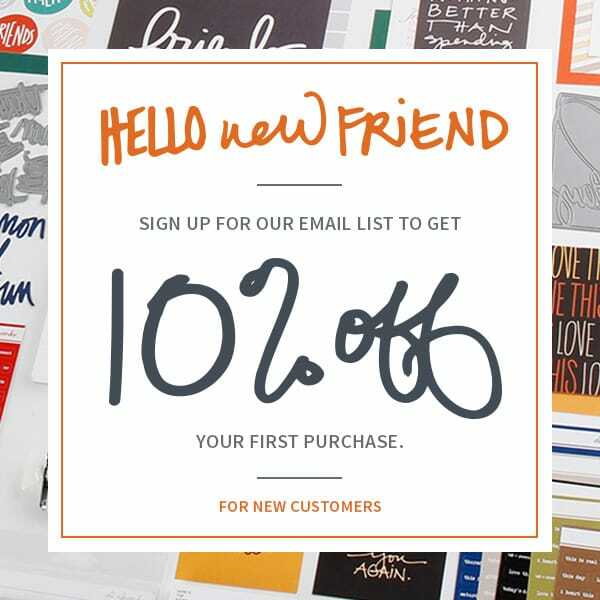 After you have made a purchase from an online scrapbook site, or located a free element, the next step in the process is downloading the package to your computer. 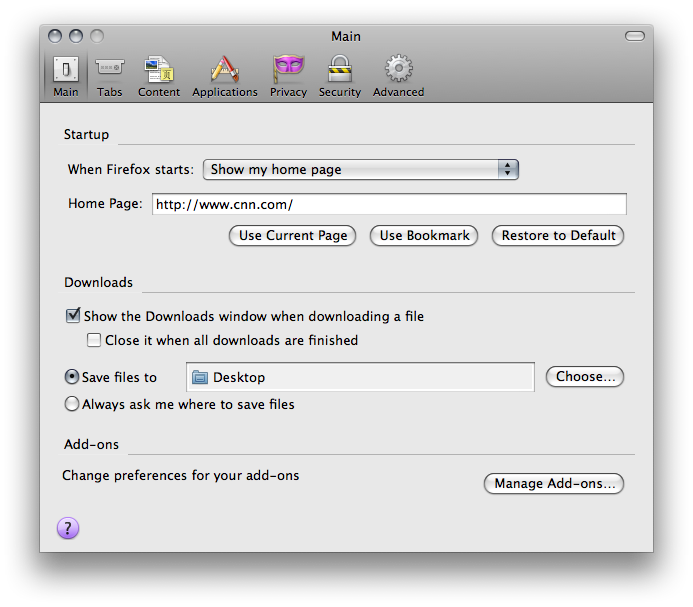 Most sites give you immediate access to your files. Check with the store you are purchasing from for specific details on how you retrieve your purchased files. Depending on what browser you are using (such as Firefox, Internet Explorer, Safari, etc.) when you click the link to download you will be asked what you want your computer to do with the file. Initially I save all my downloaded files to my desktop - I like seeing them there before I move them to their permanent home. By selecting this option at download, when I double click the zipped file on my desktop it automatically unzips the folder using Stuffit Expander. To unzip or "expand" downloaded files you need an unzip program. 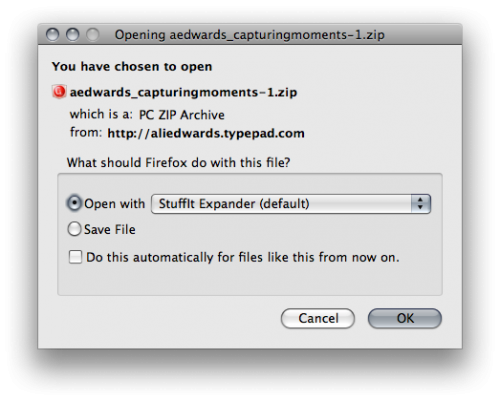 If you try to open the zipped file in Photoshop or Elements it will not work. It is likely that you may already have a program to unzip files on your computer. The program I use is called Stuffit Deluxe which allows me to both "zip" and "unzip" files. Unless you need the ability to zip files I suggest their free program: Stuffit Expander. Here's a list of more free unzip programs. When you unzip the file (to do this I double click on that file) you should see a folder appear in the same location with the same name minus the .zip extension. NOTE : If by chance you end up with any files beginning with an underscore (looks like this "_") you can delete those files. 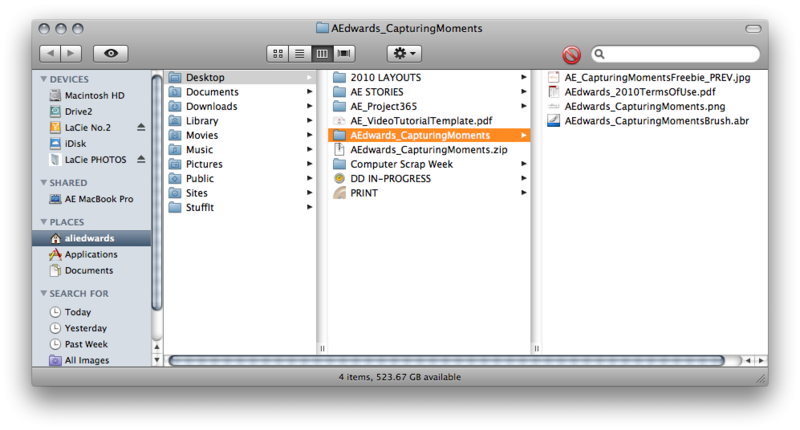 For some reason when I zip files here on my Mac and they are opened on a PC they end up with these extra random files. If you purchase any of my products from Designer Digitals this will not be an issue as they are re-zipped before being added to the store. 1. A preview file that let's you know what's inside the package you have downloaded. Sometimes this preview includes all the elements and sometimes it only shows some of the elements (meaning you will need to look inside the folder to see all the elements that are included). These previews are generally the same previews you see in the shopping section at online stores. 3. The element(s). In the case of this download there is just one .png element. This is what you will open in Photoshop or Word. 4. Some products include an .abr file which is to be loaded into your brush palette in Photoshop or Elements (more about importing that tomorrow). After I have unzipped the file and see the folder on my desktop I put the .zip file in the trash. Many people save all their zipped files or burn them to a DVD or store them on an external hard drive (which is smart if something happens to your main hard drive or the drive in which you are storing all your elements). I regularly back up my collection of elements to a second drive. That's the basics of downloading and unzipping. Depending on what programs and operating systems you have on your computer things will likely look a little different. There are lots of different ways you can go about organizing and storing your digital elements. 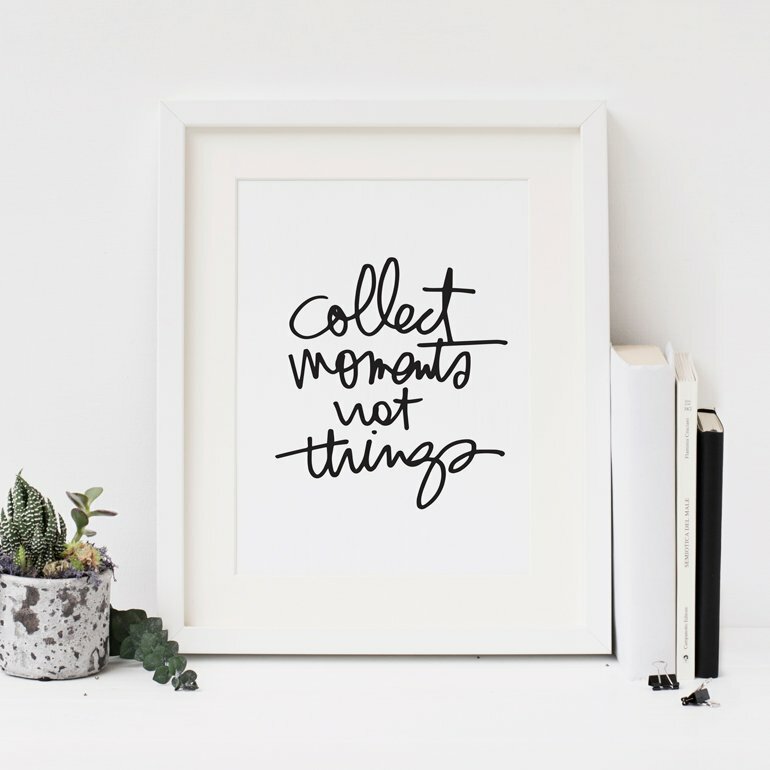 What you choose will likely depend on a number of factors including hard drive space, time, interest, level of organization, number of products, amount of digital scrapbooking you plan to do, etc. From reading a bit about this online I have found that people use a variety of different programs to organize their digital elements including ACDSee, iPhoto, Adobe Bridge, Picasa, and Shoebox. I believe the key in all those systems is tagging the products to make searching easier. This is a very informative thread on organizing your elements at Designer Digitals (it is a bit advanced if you don't have any experience...but reading is how we learn). JessicaSprague.com offers downloadable, self-paced organizing classes for ACDsee and Picasa. To be honest, I have not tried any of those programs for organizing my digital scrapbooking supplies. Rather than use a specific program, after I download and unzip I choose to store my digital elements (both the ones I create and the ones I download) in category folders on an external hard drive: LaCie d2 Quadra Hard Disk 1 TB. This drive is backed up to a second drive just in case. This simple organization has been a really good system for me. I think part of the reason for this is that I don't have an overwhelming amount of supplies and I tend to know what I like and am fairly particular about what I download. Just as with my paper supplies, I have found that less is more in terms of getting the story told. These categories were created after I had started collecting supplies. From what I was using most I began making the folders and organizing products within each one. 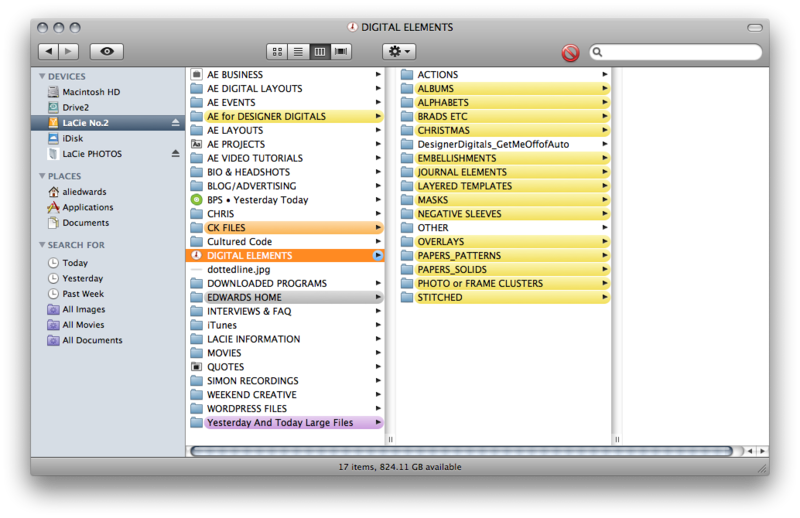 I have made adjustments here and there and combined or expanded folders based on my work flow. As I was working on this post yesterday I made a few changes to my structure. One of the big changes was eliminating the Full Kit category. Instead of storing Full Kits (packages with a bunch of coordinating elements) together I went ahead and separated the contents out into other folders: mainly Papers_Patterns and Element Combination Packs (within the Embellishments folder). The reason I did this is that I have found that I rarely use a bunch of elements from one kit on the same layout. I am more of a mix-it-up embellishment user. I find that I like to take one thing from this package and one thing from another package and add them together. The important point here is that your organization should match the way in which you work with the products. The other important point is to be flexible and ok to change things up when you find that they aren't working as well for you as you had hoped. Later this week I will address the way in which I go about selecting which supplies to use. I usually have a general idea of what I am looking for - such as a heart shape - and am able to go right into the Hearts sub-folder and select one. As someone who does traditional, hybrid, and digital I find this method of organization to work really well. I'd love to hear about how you organize your digital supplies. What works best for you? What have you tried that didn't work so great and what changes did you make? Tomorrow we will take a look at using digital elements on traditional layouts. I will walk you through my process and talk more about the different products that tend to work best for hybrid scrapbooking. Thanks Ali. It's good to see how other people approach things. I used to divide my digi kits in to files by type. Now, I save kits as kits, putting them all into a folder by month of download. At the end of the month, I back them up to EHD and DVD. If there is an element or paper that is basic and I will use again and again, I copy it to a folder of most used elements and paper. I use Picasa to view things if I can't find something. Thanks so much for doing this. I'm new to digital and had no idea how I was going to go about separating digital elements. Thanks Ali, this is all really helpful to see. Since I started collecting, I have left everything zipped in a separate scrap file. The amount of space these things take up is mind boggling! As well as the pages themselves. And for a beginner, the amount of time it takes to create a page, yikes! I do so want to try "again" this year to scrap with purpose. Hopefully, you'll address time involved and space usage later in the week' I think I get hung up on both of those and maybe I shouldn't? Looking forward to your posts. Thank you. I've been thinking lately that I would get more use out of my kits if I broke them up like you do. However, that poses a problem. What do you do when you have a kit where the designer has not labeled each part of the kit with her name and the kit name? I mean, if you post your layouts online or have them published in magazines, you need to keep track of everything you use on a layout. So do you spend the time renaming the contents of your purchased kits before you split them up? Just the thought of having to go back and do that to the hundreds of kits I own makes me freeze up! When I first started out I broke the kits apart then discovered I didn't have any way of knowing who did what in collabs! As in your case they sit in folders that has no identity as to what kit or who did them! A shame for newbies to fall into this trap. I do use ACDSee. I like it because I can go in and look at the elements before I use them. I back up to a zip drive. Thanks so much for putting it togetherand giving some insight into the system you use. Thank you for doing this Ali! I'm sure you're helping thousands of us who just don't know where to start when it comes to digi. I signed up for Up & Running with Jessica Sprague a few weeks ago, but have yet to start the course. This is giving me the boost! Thank you for the great ideas!!!!!!! Especially the one on breaking up the kits. Oh I have some organizing to do now. But, I am big on using colors to keep track of everything. Like your stuff is Yellow and Cathy Z. 's is green:) It helps to see the grouping. Ali, thanks so much for the information and the freebie! I love your elements but only have a few such as some of the Christmas ones. So, you only keep the digital elements on an external hardrive and just retrieve them as needed?? I've been getting into using digital more and I really love your templates for quickly telling a story I want to tell. My question is, can you suggest a few pattern paper packs that would work great for "everything"? Or maybe just a few that you frequently see yourself reaching for in your collection? I've got a great start on cardstock, but now I'm trying to pick a few pattern paper packs that work great for Boys, girls, families, etc. Thanks for the info! I need to organize my stuff better. Not sure how I want to go about it. My question for you-as you separate kits and items into folders, how do you keep track of who made the items? I am wondering how to keep track of that and also what kind of item it is. Thanks so much for this freebie. I love your overlays and use them often. Am just getting into this digi thing, but so far am organising in a very similar way to you. Splittling up the packs works best i think otherwise you forget what elements you have within the paper pack. Really enjoying this series - thank you for sharing your expertise with us. When I was breaking up the kits many of them included a file that was something along the line of AEdwards_KitAElements - I put that file into the Element Combination Pack (subfolder of Embellishments). I would take the time to rename them at the time I moved them into the category (all my products begin with "AEdwards_"). Yes - my external is always "on" and mounted on my desktop. Sure - I can do that in an upcoming post this week. Great tutorial! Thanks! One comment -- as far as unzipping, I just use the program that came automatically installed with Windows (using Vista right now, but did the same thing using XP prior to this). When I download a file, I have it go into a file called "Downloads" which is under my user name. Then when I double click on that file, it opens up a Windows Explorer window and one of the options within Windows is "extract all files". I click on this and then I can decide where to put my files. I extract them directly onto my external hard drive. Just thought I'd share that since you don't really have to download an unzipping program. I use a system very similar to yours, with an external drive. I keep my downloads in a file labeled "scraps to file" and then unzip them and categorize them as I go...I never keep the kits together. I also go ahead and delete those items that I know I won't ever use from a kit...no need in wasting space. Sometimes I love the kit, but a particular element or paper are just not my style, so I let myself go ahead and declutter them from my drives. ali thank you yet again for getting the heart of a matter and making it clear ;-) I now feel confident to rearrange my many files without worrying that I may have to redo it in the near future. Wow Ali! Thank you so much for doing this. You are such a great teacher! Your explanations are so clear and all the links are awesome. I have saved some digital files here and there over the last year but don't really know what to do with it. Thanks so much for sharing all your ideas and suggestions on how to do it! Thank you so much for the download. I really liked seeing how you had everything organized. 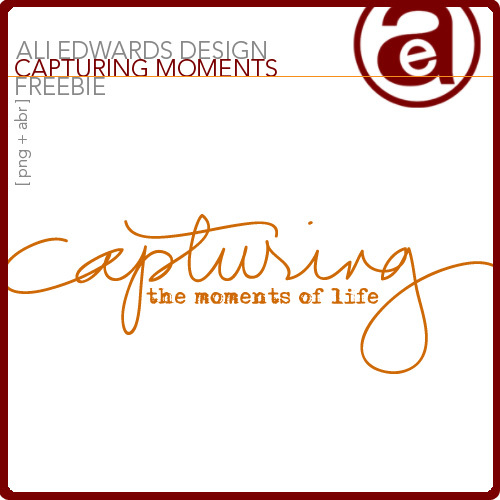 I hope to sit down and get my digital elements organized soon. Thanks again!